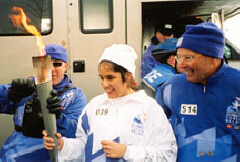 Lori Pierce; an Olympic security official (left); and Ted Clark (right); the support runner for Lori�s segment of the run, look at the Olympic torch that Lori is holding. Every member of the National Federation of the Blind will tell anyone who asks that collective action pays off. After all we are far stronger acting together than any one of us is acting alone. Recently we in Denver received a powerful reminder of this truth. Lori Pierce is a blind junior at Arvada West, a local high school. In the fall of 2001 her sister nominated her to be a torchbearer in the 2002 Winter Olympic Torch Relay. Lori received a letter from Mitt Romney, President of the Salt Lake City Organizing Committee, inviting her to be a support runner in the torch relay. Because the number of torch-bearer spots is limited, others, who are known as guardians of the flame, are appointed to be support runners. Support runners not only guard the flame but are often given the opportunity to carry the flame themselves. When Lori and her family attempted to secure her spot in the torch relay, the problems began. The Pierces were told that Lori would not be allowed to run in the relay because she would be using a sighted guide. The Olympic officials further stated that support runners must be able to participate "independently," without the assistance of anyone else. The following correspondence explains how the National Federation of the Blind got involved. I write you in my capacity as President of the National Federation of the Blind of Denver and as an attorney. Within the last couple of days, a matter has been brought to my attention regarding Lori Pierce and her invitation to participate as a support runner/torch bearer for this year's Olympics. Recently she received a letter from you and the Salt Lake Organizing Committee inviting her to participate as a support runner. Please see attached letter. Her mother then called the indicated numbers, and that is where the problem began. Lori Pierce is a high school junior who happens to be blind. She is an experienced cross-country runner and can easily meet the physical and other requirements for support runners and torchbearers. When she runs, she does so with a sighted guide, who has normally been her sister. When her mother explained these facts, she was told that Lori would not be allowed to participate. Her mother attempted to discuss this matter with a few others and received the same response. We are quite puzzled by this incident. Your own policies make it clear that individuals with disabilities will receive appropriate accommodations. "All selected torchbearers with special needs will be accommodated within the confines of the Relay." It is also my understanding that other blind individuals have participated or will participate as torchbearers and support runners. We ask for your immediate intervention in this matter. I understand that the torch will go through Denver at the end of this month. When Lori first received the invitation from you, she was very excited and honored. Since then she has been understandably upset and depressed because the honor and privilege of being a support runner has seemingly been yanked from her for a discriminatory reason. I am confident that this matter can be resolved, but given the narrow window of time we have, we will be forced to act quickly to protect Lori's rights if we do not hear from you promptly. Thank you for your attention to this letter. Please contact me, see above, to discuss this matter further. There was no immediate response to my first letter. Given the urgency of the matter, I fired off the following letter a few days later. I am writing to confirm that you received my previous letter, copy attached. Given the short time frame under which we are operating, we must hear from your office immediately. Otherwise we will have to consider other measures such as media attention or emergency litigation. The opportunity offered to Lori Pierce is a once-in-a-life-time experience, and we cannot squander it. I thank you for your attention to this letter. You may reach me over the weekend on my mobile phone, ______. I look forward to speaking with you. On January 19, 2002, the NFB of Denver conducted its monthly chapter meeting, in which we discussed Lori's problem at length. Michael Gibson, a member of the chapter and a technology instructor at the Colorado Center for the Blind, told the Chapter that his sister-in-law was an official with the Olympic Committee in public relations. Michael indicated that his sister-in-law would know the right people to contact and that the Olympic Committee certainly would not want bad publicity immediately before the Salt Lake games. On Monday, January 21, 2002, I received a call from Mary Tucker, Associate General Counsel to the Salt Lake City Organizing Committee. She said that Mitt Romney had directed her to call to see what could be done to get the matter resolved. She also told me that the Organizing Committee did not make the final decisions about who would carry the torch. Those decisions were made by sponsors of the Olympic games, most notably by Coca-Cola. Additionally, she informed me that she would contact the Coke people immediately and urge them to allow Lori Pierce to carry the torch. On Wednesday, January 23, 2002, Chris Roblyer, Assistant General Counsel with Coke, called and indicated that he had been fully briefed on the matter. He said that Coke wanted Lori to participate as an official torch bearer, not a support runner. He realized that Lori had originally been selected as a support runner but hoped that she would accept the promotion to full-fledged torch bearer. On January 30, 2002, Lori Pierce of Arvada, Colorado, carried the Olympic Torch through the streets of Fort Collins, Colorado, a community about an hour north of Denver. In an interview with her school newspaper about the experience, Lori said, "I was really nervous, but it was completely awesome. . . . They told us to cherish carrying the flame for those two-tenths of a mile because you were the only one who had the flame." On February 16, 2002, Lori Pierce, her mother Sandy, and her dad Lou attended the meeting of the NFB of Denver. Lori described her experience from being denied and then being granted the honor of carrying the torch. Her father played a videotape of Lori running with the torch and described the scene on that day. People sometimes ask, "Why the National Federation of the Blind?" The Lori Pierce story is yet another powerful and significant answer to that question. When Lori and her family attempted to fix the problem on their own, their efforts led nowhere. When the Federation answered the call, results were almost immediate. Often the problems we face are not as easily resolved as the Pierce matter. One thing is clear, however: without the Federation's collective action our continuing effort to realize true freedom and first-class citizenship will never be achieved. With it I am confident that we will be successful!